This is the 2nd part of the new TECHNIC Linear Actuators (LAs) review, which started here about three weeks ago. Working load examples with different motor types. Some possible configurations with singlte and multiple LAs. However, let’s start with a few pictures missed at the review 1st part, where we can see how the two different available brackets, directly attach to the LA. The image on the left shows the bracket used for articulated mounts, while the center one shows the adapter designed for fixed mount or direct connection with PF motors. Another complementary information to part I of this review, regards LAs internal clutching. I revised the initial information to say that LAs design, include in fact some internal clutching mechanism, for part protection sake in opposition to what initially wrote. Didier went even further than I, disassembling one LA to see exactly that, as illustrated below (images gently provided by Didier). 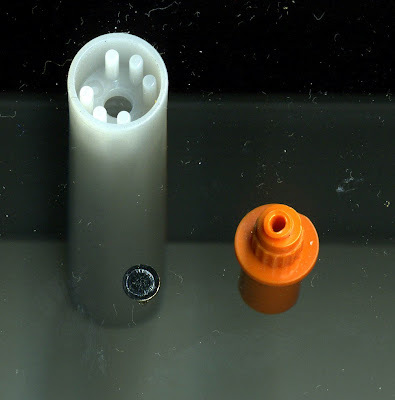 It becomes obvious from the pictures, that when load goes above a certain limit, internal force increases and the clutch mechanism enters in action, allowing the orange part to rotate against the white tube. It makes a characteristic noise as you will be able to ear on a video demonstration in the next section (below). This is intended to protect actuator from getting damaged and at the same time allows LAs to continue working normally as soon the driving source changes direction. I’ve made a setup to measure how far we can go stressing a LA, before the internal clutch starts to actuate. The tests performed were simple Push Load tests, as you can see on the videos below. The conclusion is that LA extends till it finds a resistance about 3,5-3,6 Kg, when the clutch gets to absorb all the driving movement. I’ve found the readings to be just a bit higher when the PF XL-Motor is used, if compared to the PF M-Motor. However I’ve also observed the measures to slightly increase each time the experience was repeated, probably due to some permanent effect caused by letting the LA clutch slipping for sometime. This fact prevents a definite conclusion about this small different behavior between M- and XL-motors, without more systematic measures. As found on some applications below, there are other motors that stall under certain load conditions, preventing them to rotate at all and by consequence to make the LAs to extend or retract. So it means the required resistance to actuate the clutch is not even reached. Despite this was observed with multiple LAs assemblies, it rests to measure the maximum admissible force for these motors like the LEGO micromotor in these setups. It is also possible to make some Pull Load tests, which were however not yet conducted, because they require a more complex and less reliable setup. Also I do not expect significant measurement differences, between Push and Pull measurements. In order to evaluate the LAs capabilities under significant load conditions and some advantages over LEGO pneumatic cylinders, I’ve prepared a demo using two LAs in a back-to-back (B2B) configuration to raise/lower the boom on the heavy TECHNIC Mobile Crane (8421). The pneumatics tend to leak some air under the pressure of the heavy boom when raised (especially if extended too), which progressively gets down in some hours due to the air leaks. When the pneumatic switch position is turned to lower the boom, it goes down abruptly if not manually sustained. In detail below, some photos for the 8421 adaptation performed as well as a comparative image between the back-to-back mountings, with pneumatic cylinders and LAs. As it can be seen on the video below, the setup with LAs behaves reasonably well in almost every condition. Just when the boom is fully extended and almost totally lowered (in fact an unrealistic situation), we can hear the gears slipping for a while, since the torque should be very high. This is the situation where a small motor like an hypothetical future PF S-Motor would have a nice looking fit. However it was not possible to move the boom when using smaller and less powerful motors than the XL. Not even the M-Motor was able to do the job, this not speak about smaller motors like the micromotor or the custom motor from Mauricio/iLegos . As seen in the previous section, both M- and XL-Motors perform in a similar way during the load tests, however in this particular boom position and forces configuration, it seems the stress is put more on the motor than on the LAs clutch mechanism which should explain why some motors stall and don't even start to rotate (note that also the LAs clutch doesn't actuate while the boom is raising/lowering). Gearing down the motor output could have helped, but it would enlarge the design which is also not intended for this specific solution. Now, some examples of simple methods that can be used to drive a LA in a single setup. Some configurations with single and double bevel gears (from left to right: B12t + B20t; DB12t + B12t; B12t + B12t). Some other configurations with gears (from left to right: DB12t + DB20t; z16 + z16; z8 + z24). As seen in these pictures, former 4L U-joint (left) won’t work here, if you intend to use the capability of this bracket for an articulated setup with the bottom axle holes. However the new 3L design (right) will make a perfect fit. (however limited by only one length available, 26L with 2L and 5L axle ends). Below some examples of possible configurations where two LAs get used in conjunction. This setup uses a mixed LA bracket configuration, to make it smaller or more compact. As seen from the pictures above, several type of motors can be used, depending on the force and speeds required. However in opposition to the example above, it shows an alternative how to build this setup in a non mixed bracket configuration. Some care was taken with gears setup, so both LAs rotate at the same speed. This way both pistons extend and retract at the same velocity, also reaching the same limit positions. And below two other designs. On the left one variant using z16 to avoid to care about different sized cogs. On the right a bit larger but another design for the same result. The design below was achieved based on the similar symmetrical setup (one of the designs above), where one B12t just changed position to modify the symmetry behavior. And again, a variant based on the correspondent symmetrical design (find it at the section above), where one B12t just changed position to modify the symmetry behavior. This is for instance a typical configuration to mimic the boom lifting mechanism as used on real excavators. In the designs here presented, it turns obvious that gear geometry is much faster than worm geometry. However, of course there are other designs possible and this may be the desired effect also at some applications. With a small change to the geared version of the previous “Parallel synchronous setup”, we woul obtain this variation performing an alternate motion. Later, I'll post here at TBs also some synchronous configurations, for 3 (equilateral triangle geometry) and 4 (square geometry) LAs. Since the first references here to the new LAs, they have been compared with the older LEGO pneumatic cylinders. They offer advantages and disadvantages. For a comparative, refer to this TBs previous post from Alexandre (see both post and respective comments). Also for a physical comparative of both, take a look at this article in “La Mounière” blog (although in French), despite we have a different understandings for the parts measured lengths. From above you can compare both pneumatics and LAs, while retracted and extended. Also interesting at this post are the considerations and comparations (pneumatic cylinder vs LA) about how pistons flex when extended. An effect that with some attention, we could also observe from the video above in this post, where functional tests on the '8421 Mobile Crane' are conducted. The conclusion is that the piston from pneumatic cylinders is much more resistant to flexion than the correspondent from LAs. The LA extra piston length (5L vs 4L) justifies part of this, but it is a consequence mainly from the internal design differences among both parts. The new LAs allow for unprecedented and accurate linear measures in what concerns LEGO parts. As Sariel explained in his LAs analysis at Klocki, while traditional LEGO worm gears need 6 revolutions to extend 2L, LAs take 26,5 full revolutions to extend or retract 5L. This means we have just got the most accurate LEGO linear measuring solution, with 5,3 revs/L accuracy, against the 3 revs/L for the regular LEGO worm gears (almost doubled). Despite we have seen above that in load situations small motors do not perform for the needs, these still have a valid use in many other situations. The release of the new LAs, has also increased the need of a new PF S-Motor for compact designs, although not very demanding in terms of torque. If such motor will ever see the daylight, it would be useful they would have a versatile design, so they can be easily setup for longitudinal or perpendicular uses. Hope you have found useful, the information here collected. And lets hope too, TECHNIC Designers come up in 2009, with another hype like they did with the LAs in 2008. Added a few more examples at 'Geared transmission' (Single configurations). Added images for a few more B2B variants. Why not do the extend tests by hand, for example by attaching an axle and a wheel directly to the LA? This way, we could eliminate the motor variable, since what we want to know is just the torque difference between the LA's input and output. As for the retract tests, maybe you could have the LA in a horizontal position, and link it to the test "piston" through a Bell crank, possibly built using one or two Technic Liftarms 3 x 3 L Shape. It doesn't ensure a perfectly linear motion, but it's simple and transmits the torque well. Regarding the crane tests: why not adding some gearing down, to make the crane operable with an M motor? The ungeared setup looks fast enough to remain usable with some reduction. Also, this particular application would be a good example of the uses the ZNAP flexible axle can have (LEGO, are you reading this? Flexible axles are desireable! ): since I don't have the 8421, I don't know well how it works; but maybe it would need a 8480-like 4-way multiplexing mechanism: wind cable, extend boom, lift boom, and perhaps rotate boom! So, what is more important is how much they extend relatively to their normal lengths. The more length two extending sections have in common, the less flexing will happen. PC's extend from 7L to 11L, which is a 57% increase, whereas LA's extend from 11L to 16L, which is a 45% increase. This could lead us to conclude that LA's flex less because they stretch less, but experimentation shows otherwise! Maybe this has to do with what Fernando wrote: internal design differences. My guess is that PC's have to have more strict mechanical tolerances to be as air-tight as possible, something that LA's don't have to worry about so much. This would lead to more slack between telescoping sections in the latter, resulting in the observed flexing. With regards to the 8421 why oh why didn't lego bring out a longer PC instead of that silly new part used to connect two back to back. Adding a hose to the other end, connected to the other port of the valve, would have added at least some resistance to the boom falling down too fast when the pressure is released. Actually it does have a 2 way multiplexer (for boom extention and winch) tho a four way (or two two ways, one in the top and one in the base) would have been better (for boom rotation and outrigger operation). "Adding a hose to the other end, connected to the other port of the valve, would have added at least some resistance to the boom falling down too fast when the pressure is released." If you try it, you will see it won't improve the boom descend behavior. Also it is quite easy to understand why. To previous Anonymous: There isn't a longer PC because of the high cost of developing a new pneumatic cylinder! To lower the jib slowly, allow a small 'hiss' of air out at a time. Precision takes practice! Alternatively, you could create a valve to do it for you - such things exist in real hydraulics - but it takes a bit of work. I made one for LEGO pneumatics which just about works - click on my name for the picture. I also geared up an XL motor 36:12 onto two LAs in parallel. It will lift my forearm in about 2 seconds. That seems about right for stabilisers on large vehicles, such as a JCB with the largest wheels driven by an XL motor per wheel. I liked the idea, didn't understood the photos and will return to the text explanation. Nice stuff. Thanks for sharing it. I liked the idea of your works. Keep it up! A linear actuator is a device that develops force and motion, from an available energy source, in a linear manner, as opposed to rotationally like an electric motor. There are various methods of achieving this linear motion. Just for those who doesn't know. Nicely presented. WHERE CAN YOU BUY THEM? I have been looking everywhere for them!!! You may buy them through LEGO Service (see the LEGO website), or through the hundreds of online stores at the BrickLink market BrickLink market. this probably the coolest toy ever invented. nice one! Whats the technic code for them? Im tryng to find the cheapest one but so far i not even found a website that evens sells them. And i dont find bricklink to helpful as it is quite expensive with the p&p. can someone tell me what the motor shown on this picture is.. i can't figure it out!! This was once produced and sold at eBay by iLe9os (you may find their link in the right column). It was however a short series and these were not seen again selling. I really do like LA's but there just not as strong as pneumatic pumps. I just built a large (huge) robot and I had to go back to pneuatics as LA's could not move the main beam. What is the number of the motor on pics 37, 38, 39, 40? Can't recognize photos with the numbers you mention. But most likely you are referring to the same already mentioned in previous comment. This custom motor, was once produced and sold at eBay by iLe9os (you may find their link in the right column). It was however a short series and these were not seen selling again.